Do you like toy cars? Do you like things that are super? I hope you at least like the latter, as this site is sort of called SUPERPhillip Central. If you don't like things that are super, then this site will soon have its name changed to Phillip Central. Sounds like a James Bond character... Maybe not. Anyway, our tenth review of the month is for a game that is available on the Wii U eShop. It's Super Toy Cars, and its engine is all revved up for this review! At least your mom won't accidentally step all over these! As a kid, I loved playing with my Micro Machines. Whether I'd be building cities with the various play sets that were put out or simply racing them around the family room table, they were great toys. Now, Eclipse Games is trying hard to hit my nostalgia for my childhood through creating a game totally based on racing with toy cars. While they're no Micro Machines (but what is, really? ), Super Toy Cars is an admirable attempt at taking something a lot from my generation played with and creating a racer out of it. It just sadly wipes out while doing so. Career mode is where all of the single player action in Super Toy Cars takes place. You begin with one toy car, and through progressing through segments of six events each, unlock credits to purchase new vehicles and upgrades. The handling of each vehicle varies. Some control splendidly, while others? Not so much. By that same token, you can purchase upgrades to boost various stats like top speed, acceleration, handling, weight, and more. Thus, even the worst performing toy car on paper can become something you can get used to controlling. I'm in the front of the pack where I belong. However, controlling your car on tracks isn't the best it could be. It has nothing to do with the controls of Super Toy Cars by any stretch of the imagination. Instead, the problem lies with the game's physics, which are funky at best and frustratingly wonky at worst. Even the smallest nudge by an opposing vehicle's bumper can send you drastically careening off course. Take a ramp a degree too poorly, and that makes the difference between a successful landing and a disaster of a jump. Many times I would take a jump perfectly, only then to my surprise I would land and lose all momentum completely, having the AI opposition pass me with glee. I felt like it was a crap shoot whether I'd successfully keep my speed up or have it let out like the air in a balloon. Please don't let me land stupidly. And that's what Super Toy Cars's later races and challenges feel like-- a crap shoot. You're always at the mercy of the inconsistent physics of the game. A race could be going perfectly, and then you touch something on the track that completely ruins your run. Seeing as how quickly the game forces you to respawn at the faintest hint of stopping dead in your tracks or going at a "wrong" angle, this becomes quite problematic, and again, aggravating. Unfortunately, all of the major actions aside from braking and accelerating are mapped to the face buttons. 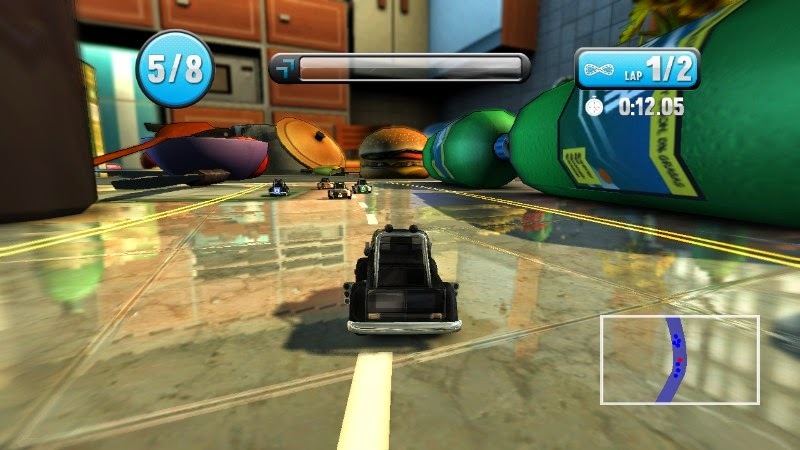 It's so easy to forget which button does what, that instead of boosting or launching off a weapon or item, you instead cause your toy car to manually respawn, costing precious seconds and in a race's term, several positions. Regardless, Career mode does offer some variety outside of traditional races. 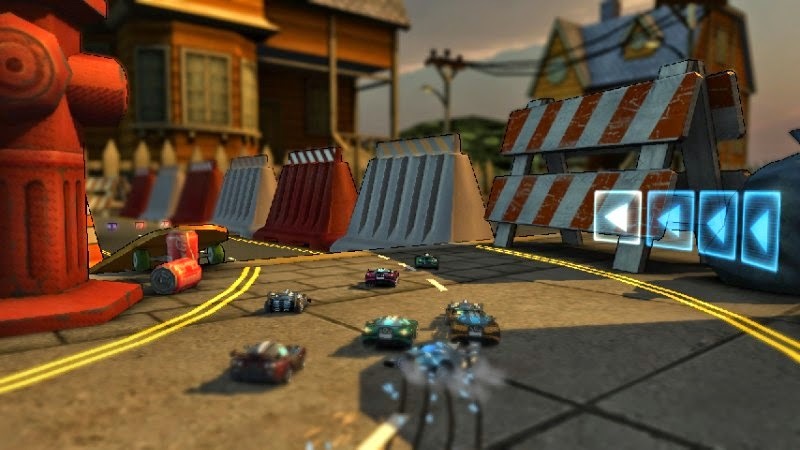 There's elimination events, where last place is routinely removed until one racer is left standing/racing, time trials, checkpoint-to-checkpoint time challenges, and really obnoxious evade events, which are elimination events with... mines splattered all over the track. ...Yeah. go thanks to these helpful track-side arrows. 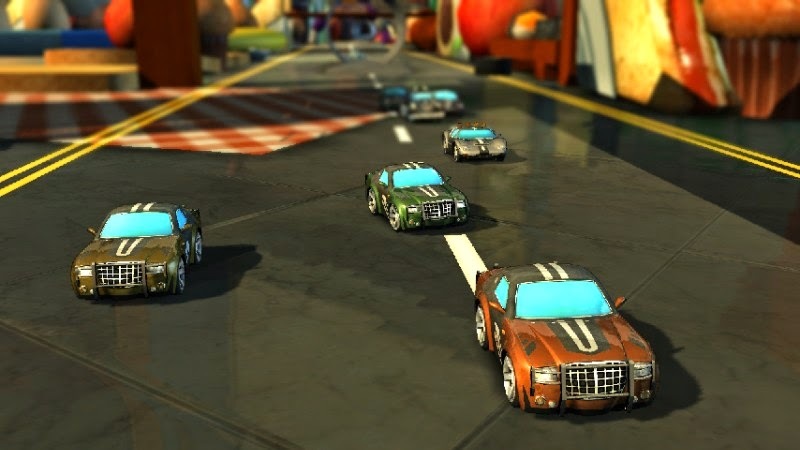 For multiplayer sessions, Super Toy Cars allows up to four local players to choose an unlocked vehicle and take to one of the game's dozen tracks. That's right. 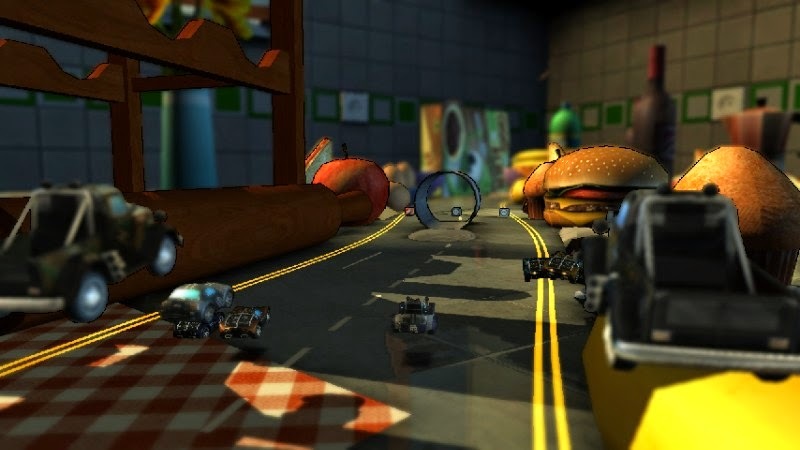 There is no online play to speak of, and unfortunately for Super Toy Cars, most people are not going to get together to play races with this game when there's a better and more exciting alternative with Mario Kart 8. He who is without friends plays alone. There's also a track editor and creator to tool around with, but I was unable to do much with it. 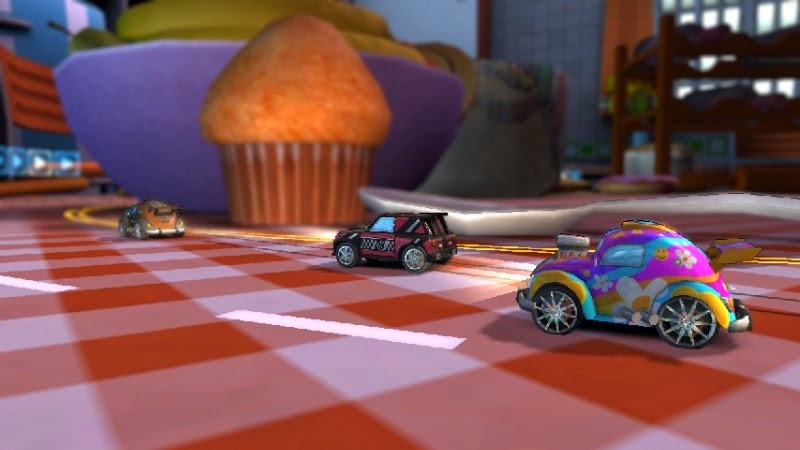 Each visit to the track creator always ended with me having to pull a cord from the back of my Wii U system, because the system would hard lock thanks to Super Toy Cars's track creator. It's a shame, because I would have loved to see how robust the creator was. It'd also give more variety in the track selection, racing on my own tracks with friends. That surely would have been an incentive to try out this game in multiplayer! No sarcasm intended either. It genuinely would. The already preexisting tracks feature a handful of locales: a kitchen, a family room, a garage, a driveway, etc. Everyday objects line the turns and straightaways of each track, things like motor oil cans in the garage tracks and produce and aluminum cans in the kitchen tracks. The tracks are serviceable in their design, and they do their jobs well. There could be some more variety in the designs, as many obstacles repeat themselves throughout the tracks. take all of these screenshots. Super Toy Cars looks the part of a child-friendly racer. There's nothing here that really stands out as fantastic in the presentation, save for the blur effects in the photo mode, but it all adds up to something that works and works well. The music is all licensed from the same alternative band, and there's not really much to add about it. It's just there. What I do wish was "just there" was some kind of fanfare for crossing the finish line. As is, each race ends so anticlimactically. Furthermore, the text used in the game for menus and to describe each event type is so narrow that I had to move up to be able to read it. I sure hope a dog doesn't "use"
this fire hydrant right now. 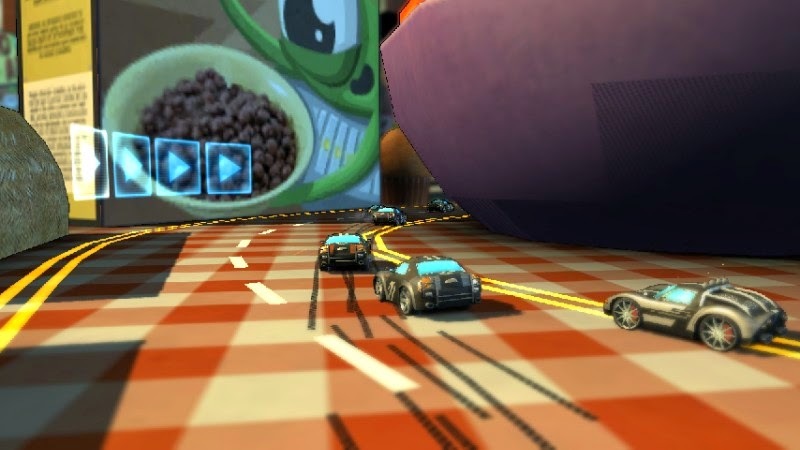 For those looking for a racer on the Wii U, there are far worse choices than Super Toy Cars. At the same token, there's far better choices, too. The wonky physics, unimpressive presentation, freezing issues, and lack of online make for a hard sell, and rightfully so. 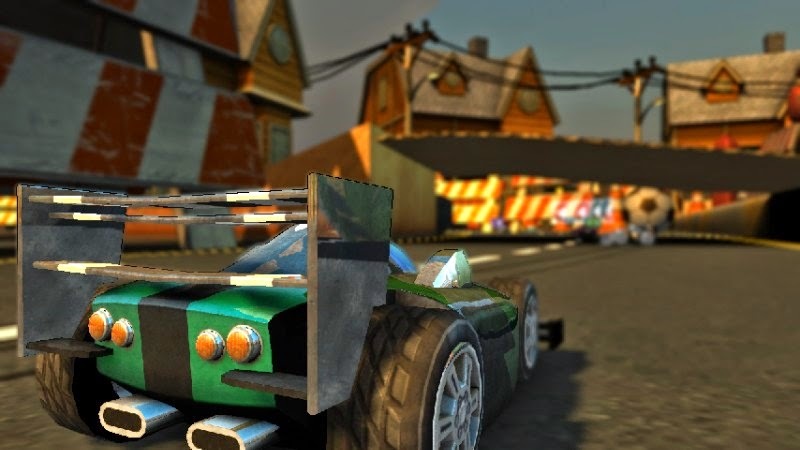 While I didn't really enjoy what I played of Super Toy Cars, I must give credit where credit is due-- the team at Eclipse Games have something really good as a foundation right here. Plus, it did give me the great desire to pull out my old Micro Machines toys and start going hog wild! The frustration with the physics of the game was almost worth that alone!